Twelve South today announced a new horizontal stand designed specifically for the new model of Mac Pro. Unlike most of Twelve South's product line, the BookArc for Mac Pro is made of a shinier chrome plate that offsets the deep black colors of the Mac Pro itself. The specially designed stand allows Mac Pros to be placed horizontally, saving vertical space in cabinets and on shelves. Earlier in the year Apple confirmed horizontal placement of the Mac Pro unit was safe and operable, under certain guidelines. 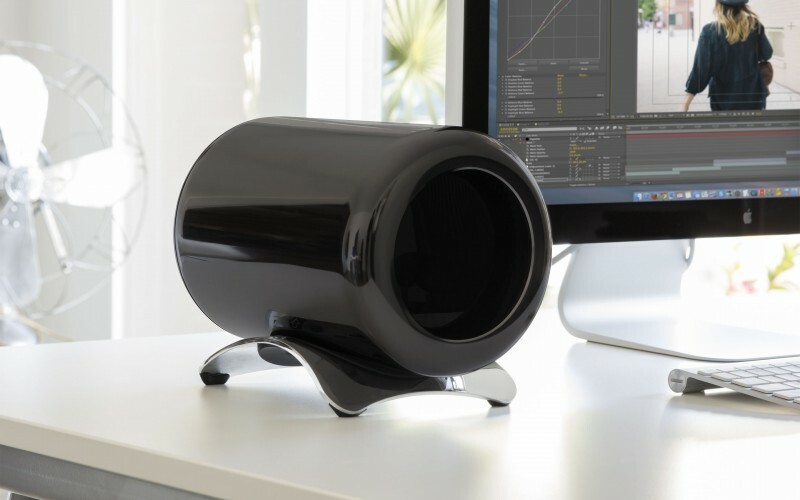 The beautiful, arc-shaped stand holds a Mac Pro horizontally, cutting the vertical height requirement in half. A lower height increases the number of places you can park the most powerful Mac available, including inside professional gear racks and studio shelves. Is it safe to use a Mac Pro horizontally? Absolutely. It will perform exactly the same on its side as it will upright. In fact, the Apple Tech Note that refers to using a Mac Pro on its side was the inspiration for designing this curved metal stand. Historically, most stand-alone Macs were able to be used on their side or vertically. Twelve South now brings this flexible option to the newest Mac Pro with the BookArc for Mac Pro. According to Twelve South, if placed inside a racked studio cabinet the Mac Pro on BookArc takes up only seven spaces against the fifteen it would occupy if placed vertically. Twelve South also sells BookArc for a wide variety of Apple products, including ones for MacBook Pro, MacBook Air, and nearly all lines of iPad, including the new iPad Air 2. The BookArc for Mac Pro can be purchased today for $59.99 from Twelve South's official website. Hot air rises. It was designed to sit the way it does for a reason. Turning it on it's side means it doesn't rise out the top but instead can heat up other components that it wasn't designed to have heated in that way. Who says, "I wish this Mac Pro took up more space and I'd like to have $60 less than I currently have." Hot air rises. It was designed to sit the way it does for a reason. * Provide enough space at each end of the computer for unrestricted airflow into the base and out the exhaust at the top. Make sure that the air intake and exhaust ports are not covered. * When using multiple Mac Pro (Late 2013) computers, do not direct the exhaust at the top of one Mac Pro towards the intake of another system. Place the computers side by side with a gap of at least several inches between them. This looks really nice.....until you plug ANYTHING in. Doesn't look like there is much clearance at all underneath for connectors, and they'll look terrible coming out of the top or side! Can't use the Mac Pro as a trashcan anymore. Major fail. I actually like how it looks like this better than upright! Even if that was true, air currents would in no way be enough to cool it. That's why there is a fan. I like it when they display these things that are supposed to organize your desk, without any cables hooked up, super tidy. Don't forget the thing has 6 Thunderbolt and 4 USB slots, as well as HDMI and audio. If you plug a lot of things in it like I do, it's going to look awful horizontally. But if you don't, then it is something to consider.